We would all like to make teeth move faster. This new trial looks at the effect of AcceleDent on the rate of Invisalign treatment. Recent research has shown that there is no evidence that AcceleDent increases the rate of tooth movement when evaluated in good randomised trials. However, one criticism of these studies is that the investigators have not adapted adjustment intervals to reflect the speedier tooth movement. These investigators did this in this new trial. I thought that it was interesting, but we need to look at it very carefully. A team from the beautiful city of Ferrara, Italy did this trial. The EJO published it. “Was there any effect on the accuracy of tooth movement with Invisalign when low frequency vibrations are used with Aligners replaced every 14 and 7 days”. Participants: 45 orthodontic patients with a mean age of 27 years (range 14.8-46.9 years). A: Patients had conventional treatment with aligners replaced every 14 days. B: Aligners replaced every 14 days with 20 minutes of vibration therapy. C: Aligners replaced every 7 days with 20 minutes of vibration therapy. Outcome: Accuracy of tooth movement with respect to the prescription. They collected data from pre and post-treatment digital models and the ideal final model. They analysed the tooth movement by superimposition on a Cartesian grid that they constructed from other tooth points. In effect, they superimposed the models on teeth that could be moving. I will come back to this later. From this data, they calculated the accuracy of tooth movement. They looked at individual tooth movement with simple univariate statistical analysis. They provided no information on the total duration of treatment for the intervention groups. I could not understand why they did not include this in the paper. All the patients completed the trial. 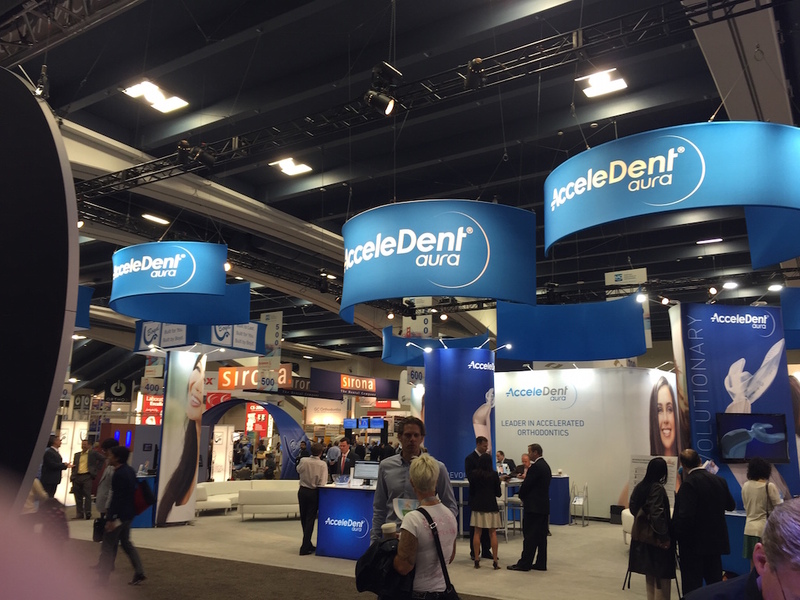 When they looked at the compliance data with the AcceleDent device, they found that they achieved 80% compliance for the required 20 minutes per day. They provided a large amount of data on the amount of predicted and actual tooth movement data. I found this really confusing. As a result, I decided to concentrate on the primary outcome measure of the accuracy of tooth movement. However, this was also rather complex and was confined to degrees of rotation of teeth. In other tables, they divided the tooth movement into maxillary and mandibular teeth and again reported the movement by tooth group. They did not include information on total tooth movement in these tables. The only important thing that I got from these tables was that the differences in accuracy were small, i.e. less than 0.7 degrees. They then highlighted the statistically significant variables with no consideration of their level of clinical significance. Vibration had no effect on the accuracy of tooth movement when aligners were replaced every 14 days. When they changed aligners every 7 days with vibration, there was no difference with the 14-day protocols. “In our sample, adding low-frequency vibration to the aligner protocol enabled us to reduce treatment time by 50 per cent without compromising accuracy. This seems to align with the research, that pulsating forces are clinically shown to stimulate the cellular activity in orthodontic treatment”. The only evidence that I could find on this was that the 7-day protocol plus vibration resulted in the same tooth movement as the 14-day protocols. Unfortunately, this is an entirely misleading and incorrect statement. They can only have reached this conclusion if they had included a group who changed the aligners every 7 days without vibration. This is because the 7-day aligner change may have speeded up tooth movement without vibration. I have looked at this trial closely. I thought that there were several significant problems. When I looked at the overall risk of bias. They provided no information on randomisation and concealment of allocation. This puts the study at high risk of bias. I thought that the sample size calculation was inadequate. This was because they did not give sufficient detail on the effect size that they were hoping to detect. The statistical analysis was too simple. It should have been a multivariate analysis that would take into account co-founders, such as gender and start malocclusion. They measured the tooth movement from a reference plane that was based on the teeth. These could have moved. As a result, it was completely misleading. The study needed a 7-day protocol without vibration to answer the study question. The measurements that they highlighted were not actually of any clinical significance. They did not report the total treatment duration. This was a major problem because this is the most useful and clinically meaningful outcome. I am sorry to be so critical but a refereed journal published this paper and it does make claims that may be used in advertising material. I am still confused about how they reached their positive conclusion about the effect of AcceleDent. Conflict of interest: This project was supported by a research grant from OrthoAccel Technologies. Thanks again for pointing out flaws in studies that can influence our purchases and promotional activities. Sometimes the truth hurts. Best of luck with blog finance, I would hate to lose what appears to be the only objective source on research. I’m curious as to what coordinate reference system you would endorse for tooth movement analysis. I’ve heard some skepticism expressed about the repeatibility of the palatal rugae as static anatomic structures and I’m not sure what else you would use (especially with anchorage segments that may move even attached to TADs which could have up to 1mm of movement as well). On another note, sham-devices were not used? Thanks. Clinically signifiant difference for the patient is the name of the game nowadays. Although the threshold of clinical significance varies between clinicians and patients alike there is a reasonable amount to be proposed. 0.7 degrees certainly does not seem a deal breaker. Had the company sponsoring the RCT a say in the interpretation of the results? Sometimes they simply donate products but do not interfere in the analysis and interpretation. It is hard to conduct research when there are constant changes in the appliance and protocols so unfortunately the paper is out of date as the protocol has been 7 days for ~2 years now. For some movements this is an average rate of movement we would expect with fixed and so the outcome is not surprising. However, I am surprised the journal accepted the paper and result. As you point out, there is no comparison group for 7 days with no vibration! Donation done and keep up the excellent work please Kevin. hello Kevin. keep up the good work with you blog. Hope you get all you need. How do we make payments in From India..Any suggestions Sir? You can do this through the donate button and this should take you to PayPal which will take credit card donations. It’s too bad they put forth so much time and effort with a flawed design, especially since weekly aligner changes have been commonplace with some orthodontists for over a decade. Often missed in these discussions on acceleration is that there is greater difference in the rate of movement between patients than anything in most findings. For most patients I would suggest that we as orthodontists are the rate limiting step with practice and biomechanical inefficiencies. It would seem to me that what we have learned from most of these studies is that we can move through treatment more quickly for many patients and if they don’t respond, slow down for those individuals. BTW would not let me donate from my phone, I had to use my computer. Strong point Dave. I have considered the most important factor in accelerating an orthodontic treatment the diagnosis and execution capability of the orthodontist but twisting it also as a slowing down factor is certainly valid!